A 5.3mm (0.2in) thick 4G phone has been announced by Japan's biggest telecoms firm NTT Docomo. 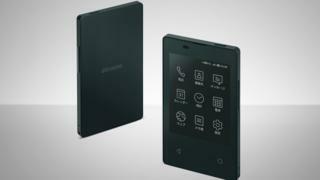 The phone - dubbed Card Keitai KY-01L - will be made by electronics firm Kyocera. The "simple, easy-to-carry" card phone is seen by NTT Docomo as a useful extra device for people who have already purchased large-screen smartphones. NTT Docomo describes the mobile as the "world's thinnest" but that claim is likely to be disputed by other phone makers. Ben Wood, chief analyst at research firm CCS Insight, said: "This flurry of so-called companion phones reflects the desire of phone makers to try and find new sales opportunities in a saturated market. "A small companion phone looks like an appealing idea on paper but the devices tend to be a compromise and furthermore consumers have to pay for them over and above their existing smartphones as well as often requiring additional airtime fees too."